For all of our VEGAN and P.E.T.A. friends, Arbonne is a perfect fit for you too. Check out our VEGAN make-up. I enjoy knowing there are no animal products or by-products in my makeup. As in our skin care, you can really feel the difference our botanically based Vegan formulations make in our products. I hope you truly understand what it means that a company does not use animal by products in their formulations. Google Animal Rendering and Tallow and see what you find. I hope you have a strong stomache though. I have never really believed all of the lead in lipstick, whale lard in skincare internet stories. I think part of it was that I wasn't sure what to do or where to get products. It seemed like a huge difficulty. Through becoming a more informed consumer, I have found that indeed these animal products and more unsafe ingredients are found in most personal care products. But now you guys, you and I both know where to turn for the right products we can trust. 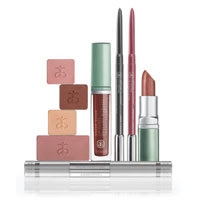 This makeup, which Arbonne calls our Color Line, is just as outstanding as our skin care. Click on the title above to check out Arbonne's Color Line.